Surely one aircraft hangar is much like the next? Well, not quite, especially when it’s an MRO, or Maintenance, Repair and Overhaul facility. My name is Denis Williams. I am a DIO project manager and I’d like to tell you about the new MRO that I’ve been involved with at RAF Brize Norton. First off a bit of background. Following the Strategic Defence Review, it was announced that RAF Brize Norton would be the single UK station for all RAF Air Transport. The Airbus A400M Atlas aircraft will gradually replace the C130J Hercules as our tactical air transport and will be based at Brize. To support these new aircraft it was decided to construct a special hangar, or MRO, which would also have the capability of accommodating the Boeing C-17 Globemaster III and Airbus A330 Multi Role Tanker Transport (MRTT) Voyager aircraft. The project was split into three parts: the ‘enabling’ stage, the works contract and lastly the main building contract. The importance of the ‘enabling works’ contract can’t be underestimated. This separate programme of works helped speed-up the project as a whole and manage costs. Basically it included things like the relocation of on-site Great Crested Newts and the diversion of existing utilities that crossed the proposed site. These tasks were completed at the same time as the design work for the main building. 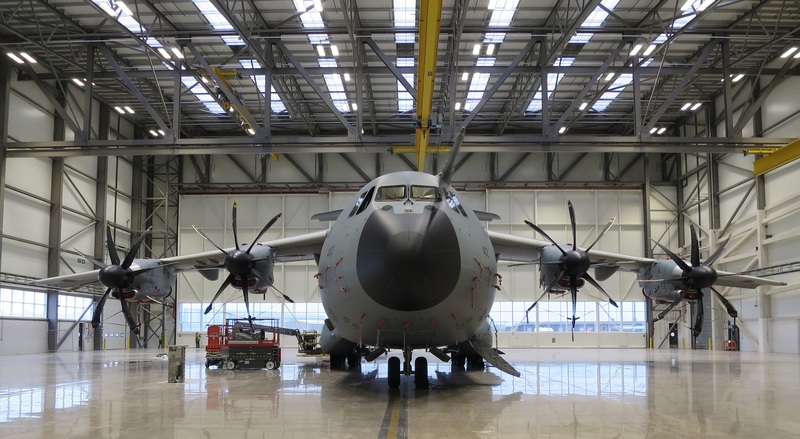 The MRO’s main purpose is to provide in-depth maintenance for the A400M aircraft, but with the capability to service the two other types of aircraft. The building has a steel frame and includes overhead travelling gantry cranes in the three-bays and in several of the stores and workshops. 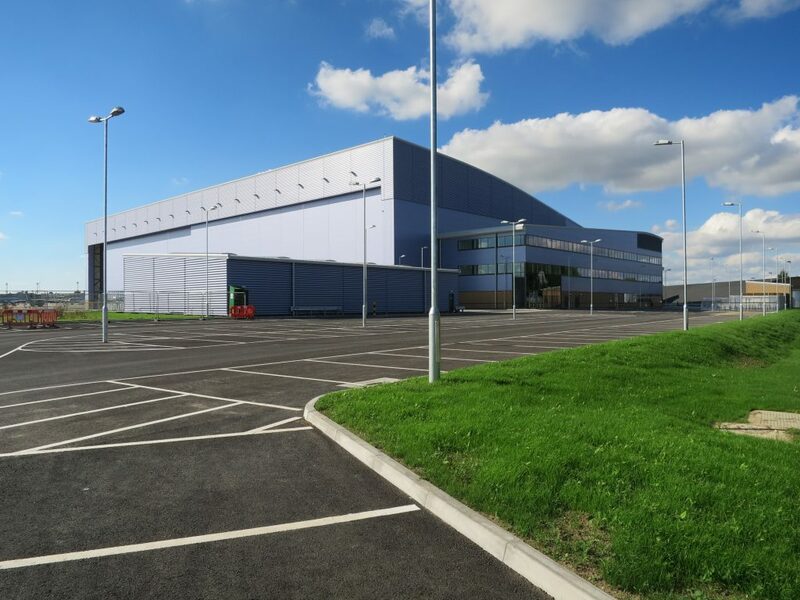 The building is clad in long-span composite cladding panels which eliminate the need for large amounts of secondary steelwork and lead to a quicker build time. Steel frame construction tolerances are tightened to enable the cladding to be directly fixed to the frame. Offices and other accommodation are housed in a separate building. The total floor space was just over 21,000m2. Besides the obvious structural needs the building also had to meet a range of other criteria. This included the Crown Fire Standards (CFS), with the ability to interface with existing and future site-wide systems including radar, security, energy strategies and infrastructure networks. A Fire Resilience Risk Assessment (FRRA) meant the requirement for sprinklers was omitted. Instead there are enhanced fire detection systems using a combination of flame detection and Video Smoke Detection. Smoke ventilation is provided over and above the CFS requirement by the use of automatically opening vents which activate upon receipt of a fire alarm signal. During the tender stage Balfour Beatty focused on selecting high performing Tier 2 suppliers for key construction elements. At the bid stage we ‘partnered’ with Billington Structural Steel and NG Bailey for the building services. Early discussions were held with PJ Davidsons for the concrete to establish optimum pour sequence and outputs. Groundwork’s were carried out directly by Balfour Beatty. It’s all about the planning and about collaborative working. There was also a genuine commitment to provide high quality facilities and working environment for the work force. This was reflected in the high scores achieved under the Considerate Constructors Scheme. In-built sustainability was an important consideration within the building’s design. In terms of water and energy, our aim was to reduce, reuse and recycle wherever possible. Various systems were included to minimise energy consumption. One of these was to include a 600m2 array of Photo Voltaic panels. It means the final building has achieved an ‘A’ rated Energy Performance Certificate (EPC). It has also achieved a DREAM Excellent rating through the Survey, Design and Construction Stages with a final score of 76%. The £35m Main Building Contract was awarded to Balfour Beatty in January 2015. The actual work on the hangar began following the completion of enabling works in March 2015, and the project was handed over to Defence Equipment and Support in September 2016. It was a challenging project, especially given that construction work took place close to a live runway and within an operational RAF base with all the associated security requirements. From the beginning we adopted a collaborative single team approach, and it paid off and I am extremely proud to have played my part in making it happen. Excellent project! How many charging points have been installed for the workforce to travel to work using Electric Vehicles? The future is Electric. Denis, this is a significant achievement. Nice to see the way in which the challenge presented by Fire Resilience Risk Assessment (FRRA) meant the requirement for sprinklers was omitted. Are the use of enhanced fire detection systems using a combination of flame detection and Video Smoke Detection going to become standard as part of Crown Fire Standards both for new builds and refurbishments? Are you going to use docking platforms or scaffoldings for access to the aircraft during maintenance works ? Thanks for reading. Unfortunately we don't undertake any of the maintenance, it will be done by the RAF and Airbus, so we can't answer your question I'm afraid. Hello Dennis, whilst its a fantastic job done, do you know the reason why the hanger was designed for the A400M to enter forward and not reversed in? The reason for this question is that it would have been better all-round for semi-permanent staging for the A400M to reverse into rather than the constant re-building of staging around the Aircraft. I just wonder if this was ever considered considering the number and amount of time the A400M spends in this hanger. Logistics, time, resource complexity, accidental damage and cost & of moveable staging?